Wine #2 of my Thanksgiving turkey pairing series… and I really hope I don’t get tired of stuffing and turkey before the real Turkey Day! Zinfandel and turkey are a classic pairing, because the fruit and spices in Zin tend to pair well with turkey and all the sides. 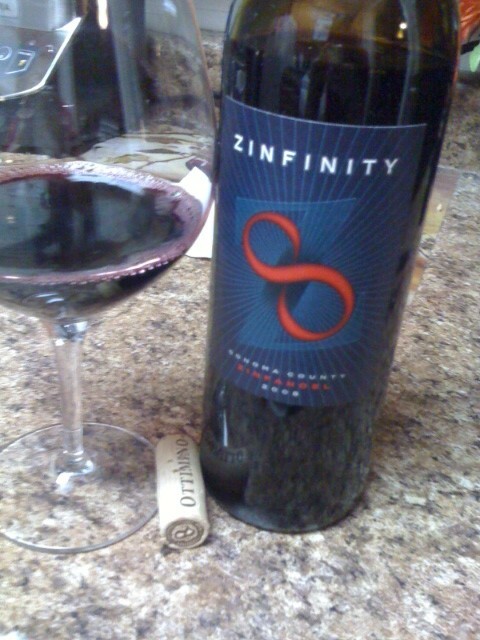 Ottimino produces awesome single vineyard Zins and I was excited to try their Zinfinity which is a blend of zinfandel grapes from a few Sonoma vineyards. Berries, vanilla, and a little smoke on the nose – this smells big and rich and lived up to the nose. It tastes like spicy blackberries, and black pepper definitely lingers on the finish. I paired this Zin with turkey and stuffing, and loved the pairing. The herbs in the stuffing definitely accented the fruit in the wine well, and the juicy berries in the zin complimented the turkey. The Zinfinity is far from a lightweight, and definitely stands up to the richness of a Turkey Day dinner. This wine belongs on the Thanksgiving table, or would be delicious with chili, burgers, or ribs. Or pasta with bolognese sauce. The possibilities are endless, this is a great food wine!